The Washington Wizards and All-Star point guard John Wall have agreed to a four-year, $170 million extension, a league source told ESPN's Adrian Wojnarowski. The deal begins in 2019, the source said. It includes a fourth-year player option and a 15 percent trade kicker. The 26-year-old confirmed he had agreed to the extension in a video tweeted Friday night by the UNINTERRUPTED, with Wall saying: "You know I wasn't going anywhere." Wall, 26, has two years and $37 million left on his current deal. ESPN reported June 30 that the Wizards had offered Wall a supermax deal, made possible because he made the All-NBA team this past season. "I just had to think it out with my family and friends and make a decision," Wall said in the UNINTERRUPTED video. "Y'all know where I wanted to be at. I'm happy I'm coming back another four years to be a Washington Wizard. Y'all know what I'm going for. Definitely gonna bring y'all the championship, that's my ultimate goal, and I won't stop till I get it." Already this offseason, Washington brought back Otto Porter Jr., matching a $106 million, four-year offer sheet from the Brooklyn Nets. The move kept Washington's young trio of Wall, Porter and Bradley Beal intact. Earlier this week, Wizards owner Ted Leonsis said he was confident Wall would sign the extension, and Leonsis added he would do what it takes to keep Washington as a contender. 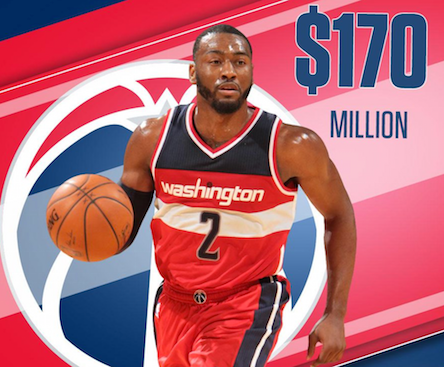 Including Wall's new deal, the guaranteed salaries on Washington's roster the next four seasons total: $126 million, $126M, $108M and $98M. "I think we've proven that we have as much resources and as much tools as anybody in the league, and we're in the [luxury] tax," Leonsis told The Washington Post. "We'll spend whatever we need to get better, but we're going to get better by keeping our core together and then adding to it." Washington went 49-33 this past season, losing to the Boston Celtics in seven games in the Eastern Conference semifinals. Wall starred throughout, averaging 27.2 points and 10.3 assists in 13 playoff games. The only other player in NBA history to average at least 25 points and 10 assists while playing at least 10 games in a single playoff season is Russell Westbrook, who posted averages of 26.0 points and 11.0 assists in 18 games during the 2016 postseason.